Bank tellers, customer service representatives, telemarketers, stock and bond traders, even paralegals and radiologists will gradually be replaced by such software. Over time this technology will come to control semiautonomous and autonomous hardware like self-driving cars and robots, displacing factory workers, construction workers, drivers, delivery workers and many others. By contrast, Lee argues that AI “is poorly suited for jobs involving creativity, planning and ‘cross-domain’ thinking,” as well as extensive education and training. Lee acknowledges that the “A.I. revolution” will eliminate “some” higher-paying job, but he sees middle-class jobs being eliminated en masse, with the companies that used to employ those workers and the companies that made the technologies that replaced them reaping the profits. The result would be “enormous wealth concentrated in relatively few hands,” requiring the construction of a huge, generous social welfare system to support those left behind. Lee argues “for a conditional universal basic income: welfare offered to those who have a financial need, on the condition they either show an effort to receive training that would make them employable or commit to a certain number of hours” of volunteer work. That would be a sea-change across most of the world not only for the economy, but also in governments’ relationship with society. My first response to this is that I don’t see much of a basis for thinking that AI will be less capable of automating high-skill/education jobs than they will low-end jobs, particularly with the rapid advances being made in machine learning. From finance to law to HR to medicine, we’re already seeing AI incorporated more and more into jobs that typically are dominated by the relatively well-off. Lee is correct that AI and robotics will be disruptive. If anything, I think Lee underestimates how disruptive AI could be–even for the economic elite. But more fundamentally, the scope and nature of that disruption is completely unpredictable at this point. Tim Worstall wrote a retort for Forbes arguing that AI will actually reduce inequality. If anything, I found Worstall’s piece less persuasive than Lee’s. Worstall’s op-ed is over-reliant on two assumptions: (1) that this wave of automation will be no more disruptive than the Industrial Revolution; and (2) that the Industrial Revolution reduced economic inequality. The first assumption seems unfounded given, again, the sheer number of jobs that seem vulnerable to automation in the face of AI and robotics. The second assumption is, to say the least, not a universally held view among economic historians. Living standards certainly improved for the poor and middle-class during this period (at least in the aggregate), but that doesn’t mean that inequality went down. Historical projections of the Gini coefficient, the most widely used measure of inequality, indicate that England’s inequality increased dramatically during the early-to-mid 19th century, a period of rapid industrialization, before leveling off and then falling just as dramatically (only to rise again starting in the 1970s). Global wealth inequality also steadily increased from 1820 until the 1950s before hitting a plateau. So Worstall’s apparent certainty about the impact of industrialization on inequality seems less-than-justified. In essence, both Lee’s and Worstall’s arguments are interesting but unproven. No one knows what the scope and nature of AI’s impacts on our economy and society will be. We’ll just have to wait and find out. It’s good to start talking now about what those impacts might look like and formulate potential policy responses to AI-led labor market disruption. On that front, at least, pieces like Lee’s and Worstall’s are valuable. But take their predictions with a grain of salt. Final note: Lee’s idea of adopting a universal basic income as an answer to AI-driven inequality echoes the paper that Luisa Scarcella and Michaela Georgina Lexer presented at this year’s We Robot conference. If you want a good, in-depth look at the potential labor-market consequences and policy responses for AI, Lexer and Scarcella’s paper is a great place to start. 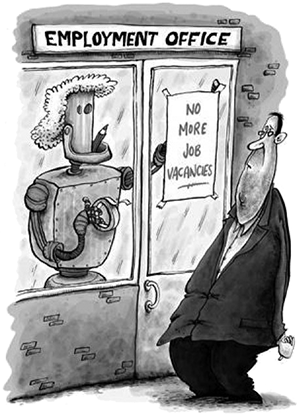 Scarcella and Lexer recognized that virtually all current jobs could be vulnerable to automation, creating a potential for unprecedented and brutal disruptions to the labor market (i.e., mass unemployment). They examined potential policy responses to those labor market shockwaves, and the ripple effects those shockwaves would have on government finance, which could have to make do with a greatly reduced tax base. Like Lee, Scarcella and Lexer point to a universal basic income as a potential solution. Whereas Lee would make the basic income conditional on either seeking employment or engaging in volunteer work, Lexer and Scarcella examined the “Finnish model” of a completely unconditional basic income. Thanks for this, Matt. I had some similar thoughts. Agreed that Lee may have underestimated two things: 1) the extent to which AI could replace “high-skill” jobs, in part because of 2) the fact that high-skilled jobs are surprisingly composed of not-so-advanced rote activities which can be automated. I do worry that we’re fetishizing 21st century skills as well. Finally, while you’re right that we’re just guessing at this point, my inclination is to hope for the “ok” but prepare for the worst in terms of labor, welfare, and education shifts. Did you see the Brookings Institute article on the same topic? It reviews the optimist and pessimist analyses and brings in a more advanced labor policy analysis. Would love to hear your thoughts on that. It also proposes re-training, career pathways for sub-postsecondary, and wage insurance rather than basic income.